Land-use and land-cover changes affect local, regional, and global climate processes. Choices about land-use and land-cover patterns have affected and will continue to affect our vulnerability to the effects of climate change. In addition to emissions of heat-trapping greenhouse gases from energy, industrial, agricultural, and other activities, humans also affect climate through changes in land use (activities taking place on land, like growing food, cutting trees, or building cities) and land cover (the physical characteristics of the land surface, including grain crops, trees, or concrete).10 For example, cities are warmer than the surrounding countryside because the greater extent of paved areas in cities affects how water and energy are exchanged between the land and the atmosphere. This increases the exposure of urban populations to the effects of extreme heat events. Decisions about land use and land cover can therefore affect, positively or negatively, how much our climate will change and what kind of vulnerabilities humans and natural systems will face as a result. The impacts of changes in land use and land cover cut across all regions and sectors of the National Climate Assessment. Chapters addressing each region discuss land-use and land-cover topics of particular concern to specific regions. Similarly, chapters addressing sectors examine specific land-use matters. In particular, land cover and land use are a major focus for sectors such as agriculture, forests, rural and urban communities, and Native American lands. By contrast, the key messages of this chapter are national in scope and synthesize the findings of other chapters regarding land cover and land use. Land uses and land covers change over time in response to evolving economic, social, and biophysical conditions.16 Many of these changes are set in motion by individual landowners and land managers and can be quantified from satellite measurements, aerial photographs, on-the-ground observations, and reports from landowners and users.11,2 Over the past few decades, the most prominent land changes within the U.S. have been changes in the amount and kind of forest cover due to logging practices and development in the Southeast and Northwest and to urban expansion in the Northeast and Southwest. Because humans control land use and, to a large extent, land cover, individuals, businesses, non-profit organizations, and governments can make land decisions to adapt to and/or reduce the effects of climate change. Often the same land-use decision can serve both aims. Adaptation options (those aimed at coping with the effects of climate change) include varying the local mix of vegetation and concrete to reduce heat in cities or elevating homes to reduce exposure to sea level rise or flooding. Land-use and land-cover-related options for mitigating climate change (reducing the speed and amount of climate change) include expanding forests to accelerate removal of carbon from the atmosphere, modifying the way cities are built and organized to reduce energy and motorized transportation demands, and altering agricultural management practices to increase carbon storage in soil. Despite this range of climate change response options, there are three main reasons why private and public landowners may choose not to modify land uses and land covers for climate adaptation or mitigation purposes. First, land decisions are influenced not only by climate but also by economic, cultural, legal, or other considerations. In many cases, climate-based land-change efforts to adapt to or reduce climate change meet with resistance because current practices are too costly to modify and/or too deeply entrenched in local societies and cultures. Second, certain land uses and land covers are simply difficult to modify, regardless of desire or intent. For instance, the number of homes constructed in floodplains or the amount of irrigated agriculture can be so deeply rooted that they are difficult to change, no matter how much those practices might impede our ability to respond to climate change. Finally, the benefits of land-use decisions made by individual landowners with specific adaptation or mitigation goals do not always accrue to those landowners or even to their communities. Therefore, without some institutional intervention (such as incentives or penalties), the motivations for such decisions can be weak. These national-level annual rates of land changes mask considerable geographic variability in the types, rates, and causes of change.11 Between 1973 and 2000, the Southeast region had the highest rate of change, due to active forest timber harvesting and replanting, while the Southwest region had the lowest rate of change. a Differences in the way certain categories are defined, such as the special uses distinction in the USDA Economic Research Service land use estimates, make direct comparisons between land use and land cover challenging. For example, forest land use (29.7%) exceeds forest cover (23.2%). Forest use definitions include lands where trees have been harvested and may be replanted, while forest cover is a measurement of the presence of trees. b Special uses represent rural transportation, rural parks and wildlife, defense and industrial, plus miscellaneous farm and other special uses. c Miscellaneous uses represent unclassified uses such as marshes, swamps, bare rock, deserts, and tundra plus other uses not estimated, classified, or inventoried. a Land in an altered and often un-vegetated state that, because of disturbances by mechanical means, is in transition from one cover type to another. Mechanical disturbances include forest clear-cutting, earthmoving, scraping, chaining, reservoir drawdown, and other similar human-induced changes. b Land in an altered and often un-vegetated state that because of disturbances by non-mechanical means is in transition from one cover type to another. Non-mechanical disturbances are caused by fire, wind, floods, animals, and other similar phenomena. Future patterns of land use and land cover will interact with climate changes to affect human communities and ecosystems. At the same time, future climate changes will also affect how and where humans live and use land for various purposes. Changes in development density will have an impact on how population is distributed and affects land use and land cover. Some of the projected changes in developed areas will depend on assumptions about changes in household size and how concentrated urban development will be. Higher population density means less land is converted from forests or grasslands, but results in a greater extent of paved area. Projections based on estimates of housing-unit density allow the assessment of impacts of urban land-use growth by density class. 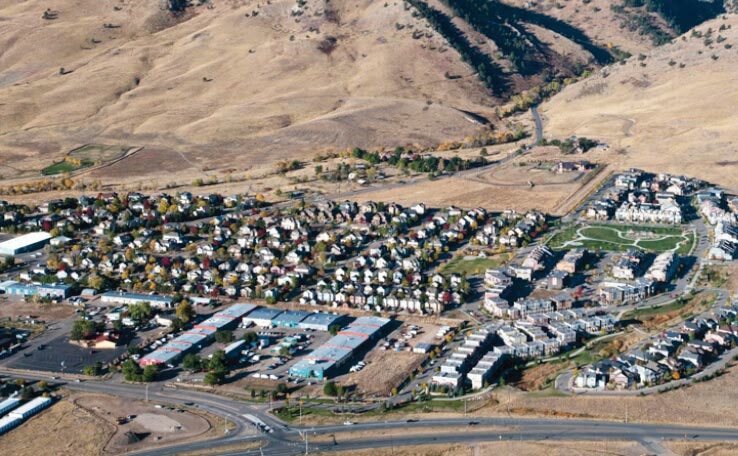 Increases in low-density exurban areas will result in a greater area affected by development and are expected to increase commuting times and infrastructure costs. The areas projected to experience exurban development will have less density of impervious surfaces (like asphalt or concrete). While about one-third of exurban areas are covered by impervious surfaces,14 urban or suburban areas are about one-half concrete and asphalt. Impervious surfaces have a wide range of environmental impacts and thus represent a key means by which developed lands modify the movement of water, energy, and living things. For example, areas with more impervious surfaces like parking lots and roads tend to experience more rapid runoff, greater risk of flooding, and higher temperatures from the urban heat-island effect. Projections of both land-use and land-cover changes will depend to some degree on rates of population and economic growth. 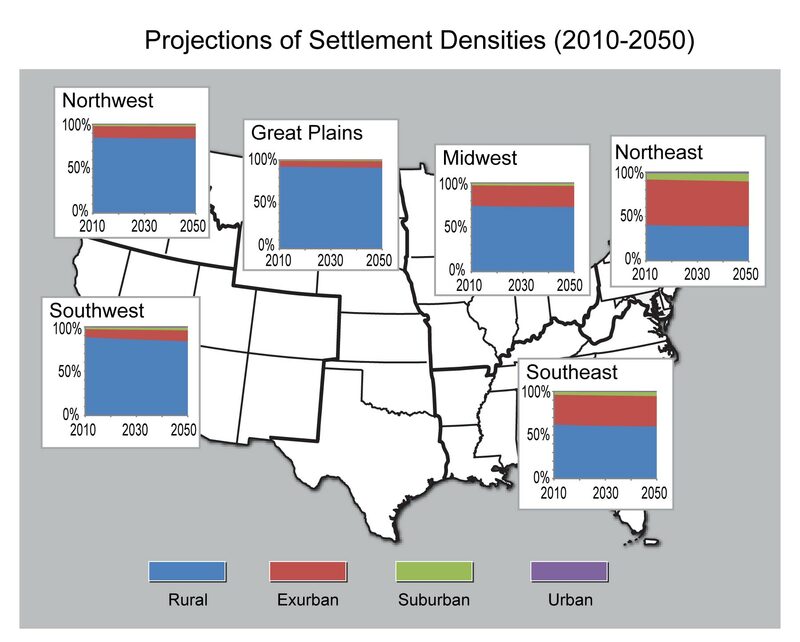 In general, scenarios that assume continued high growth produce more rapid increases in developed areas of all densities and in areas covered by impervious surfaces (paved areas and buildings) by 2050.13,14 Land-use scenarios project that exurban and suburban areas will expand nationally by 15% to 20% between 2000 and 2050,14 based on high- and low-growth scenarios respectively. 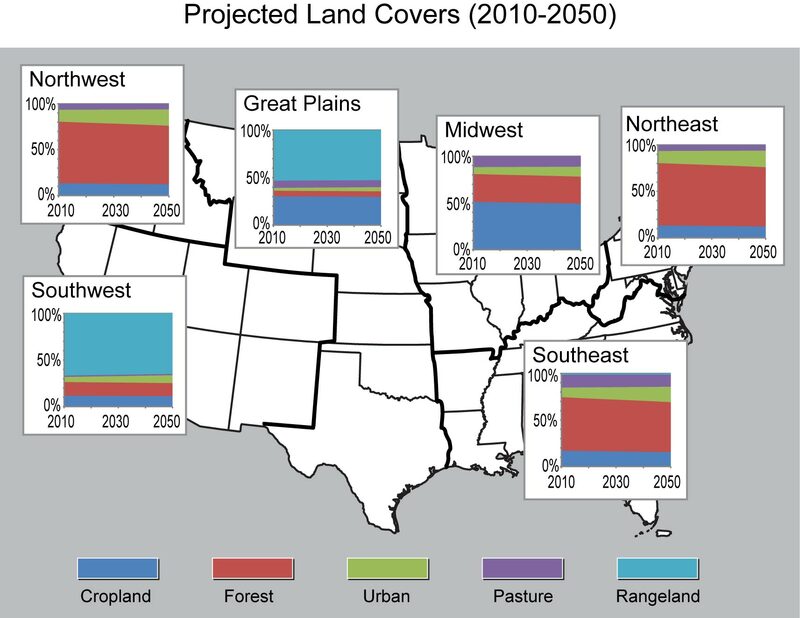 Land-cover projections by Wear13 show that both cropland and forest are projected to decline most relative to 1997 (by 6% to 7%, respectively, by 2050) under a scenario of high population and economic growth and least (by 4% and 6%, respectively) under lower-growth scenarios. More forest than cropland is projected to be lost in the Northeast and Southeast, whereas more cropland than forest is projected to be lost in the Midwest and Great Plains.15 Some of these regional differences are due to the current mix of land uses, others to the differential rates of urbanization in these different regions. Choices about land-use and land-cover patterns have affected and will continue to affect how vulnerable or resilient human communities and ecosystems are to the effects of climate change. The author team benefited from a number of relevant technical input reports. One report described the findings of a three-day workshop held from November 29 to December 1, 2011, in Salt Lake City, in which a number of the chapter authors participated.16 Findings of the workshop provided a review of current issues and topics as well as the availability and quality of relevant data. In addition, from December 2011 through June 2012 the author team held biweekly teleconferences. Key messages were identified during this period and discussed in two phases, associated with major chapter drafts. An early draft identified a number of issues and key messages. Based on discussions with National Climate Assessment (NCA) leadership and other chapter authors, the Land Use and Land Cover Change authors identified and reached consensus on a final set of four key messages and organized most of the chapter to directly address these messages. The authors selected key messages based on the consequences and likelihood of impacts, the implied vulnerability, and available evidence. Relevance to decision support, mitigation, and adaptation was also an important criterion for the selection of key messages for the cross-cutting and foundational topic of this chapter. The U.S. acquires, produces, and distributes substantial data that characterize the nation’s land cover and land use. Satellite observations, with near complete coverage over the landscape and consistency for estimating change and trends, are particularly valuable. Field inventories, especially of agriculture and forestry, provide very reliable data products that describe land cover as well as land-use change. Together, remote sensing and field inventory data, as well as related ecological and socioeconomic data, allow many conclusions about land-use and land-cover change with very high confidence. Steadily accumulating field and remote sensing observations as well as inventories continue to increase confidence in this key message. A recent study by the EPA14 provides relevant projections of housing density and impervious surface under alternative scenarios of climate change. While there is little uncertainty about the general applicability of this key message, the actual character and consequences of climate change as well as its interactions with land cover and land use vary significantly between locations and circumstances. Thus the specific vulnerabilities resulting from the specific ways in which people, both as individuals and as collectives, will respond to anticipated or observed climate change impacts are less well understood than the biophysical dimensions of this problem. Very High. Observed weather and climate impacts and consequences for land cover and land use, basic understanding of processes and analyses using models of those processes, as well as substantial literature are consistent in supporting this key message. Decisions about land-use and land-cover change by individual landowners and land managers are influenced by demographic and economic trends and social preferences, which unfold at global, national, regional, and local scales. Policymakers can directly affect land use and land cover. For example, Congress can declare an area as federally protected wilderness, or local officials can set aside portions of a town for industrial development and create tax benefits for companies to build there. Climate factors typically play a secondary role in land decisions, if they are considered at all. Nonetheless, land-change decisions may affect the vulnerabilities of individuals, households, communities, businesses, non-profit organizations, and ecosystems to the effects of climate change.21,22 A farmer’s choice of crop rotation in response to price signals affects his or her farm income’s susceptibility to drought, for example. Such choices, along with changes in climate can also affect the farm’s demand for water for irrigation. Similarly, a developer’s decision to build new homes in a floodplain may affect the new homeowners’ vulnerabilities to flooding events. A decision to include culverts underneath a coastal roadway may facilitate migration of a salt marsh inland as sea level rises. Figure 13.4: Many forested areas in the U.S. have experienced a recent building boom in what is known as the “wildland-urban interface.” This figure shows the number of buildings lost from the 25 most destructive wildland-urban interface fires in California history from 1960 to 2007 (Figure source: Stephens et al. 200919). Construction near forests and wildlands is growing. 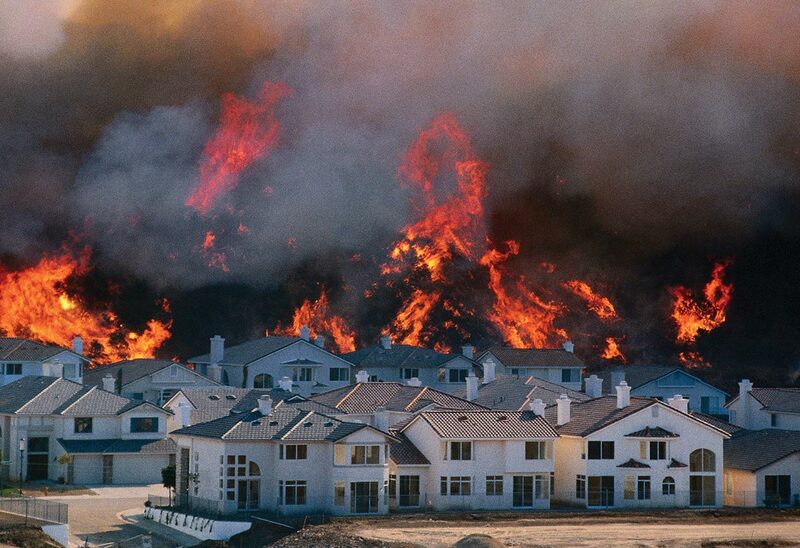 Here wildfire approaches a housing development. The combination of residential location choices with wildfire occurrence dramatically illustrates how the interactions between land use and climate processes can affect climate change impacts and vulnerabilities. Low-density (suburban and exurban) housing patterns in the U.S. have expanded and are projected to continue to expand.14 One result is a rise in the amount of construction in forests and other wildlands17,18 that in turn has increased the exposure of houses, other structures, and people to damages from wildfires, which are increasing. 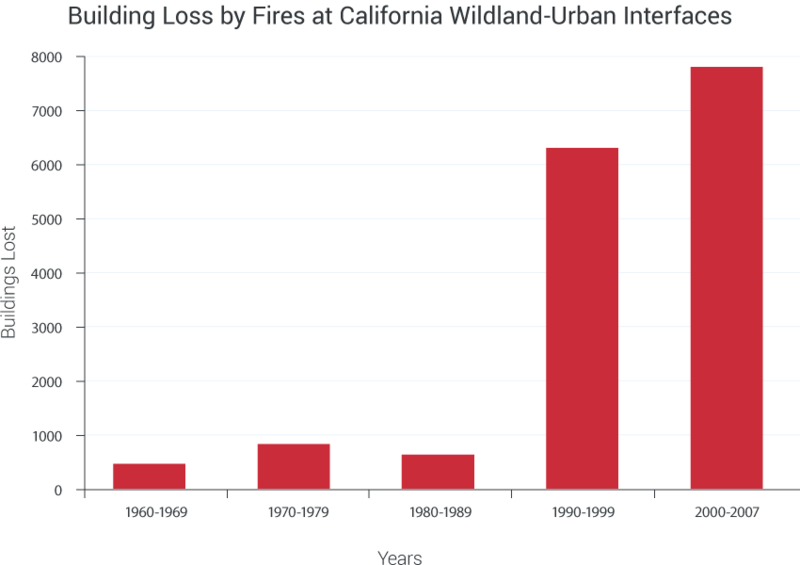 The number of buildings lost in the 25 most destructive fires in California history increased significantly in the 1990s and 2000s compared to the previous three decades.19 These losses are one example of how changing development patterns can interact with a changing climate to create dramatic new risks. In the western United States, increasing frequencies of large wildfires and longer wildfire durations are strongly associated with increased spring and summer temperatures and an earlier spring snowmelt.20 The effects on property loss of increases in the frequency and sizes of fires under climate change are also projected to increase in the coming decades because so many more people will have moved into increasingly fire-prone places (Ch. 2: Our Changing Climate; Ch. 7: Forests). The dependence of weather and climate processes on land surface properties is reasonably well understood in terms of the biophysical processes involved. Most climate models represent land-surface conditions and processes, though only recently have they begun to incorporate these conditions dynamically to represent changes in the land surface within a model run. Regional weather models are increasingly incorporating land surface characteristics. Extensive literature – as well as textbooks – documents this understanding, as do models of land surface processes and properties. A Technical Input report to the National Climate Assessment10 summarizes the literature and basic understanding of interactions between the atmosphere and land surface that influence climate. While there is little uncertainty about this key message in general, the heterogeneity of the U.S. landscape and associated processes, as well as regional and local variations in atmospheric processes, make it difficult to analyze or predict the character of land use and land cover influences on atmospheric processes at all scales. Very High. The basic processes underlying the biophysics of interactions between the land surface and atmosphere are well understood. A number of examples and field studies are consistent in demonstrating effects of land use and land-cover change on the climate of the United States. Land-use and land-cover changes are affecting global atmospheric concentrations of greenhouse gases. The impact is expected to be most significant in areas with forest loss or gain, where the amount of carbon that can be transferred from the atmosphere to the land (or from the land to the atmosphere) is modified. Even in relatively un-forested areas, this effect can be significant. A recent USGS report suggests that from 2001 to 2005 in the Great Plains between 22 to 106 million metric tons of carbon were stored in the biosphere due to changes in land use and climate.33 Even with these seemingly large numbers, U.S. forests absorb only 7% to 24% (with a best estimate of 16%) of fossil fuel CO2 emissions (see Ch. 15: Biogeochemical Cycles, “Estimating the U.S. Carbon Sink”). Individuals, businesses, non-profits, and governments have the capacity to make land-use decisions to adapt to the effects of climate change. Although there is little uncertainty that land-use decisions can enable adaptation to climate change, the information about climate change, at scales where such decisions are made, is generally lacking. Very High. The aspects of land-use planning that can enable climate change adaptation are well understood and examples demonstrate where actions are being taken. Land-use and land-cover patterns may be modified to adapt to anticipated or observed effects of a changed climate. These changes may be either encouraged or mandated by government (whether at federal or other levels), or undertaken by private initiative. In the U.S., even though land-use decisions are highly decentralized and strongly influenced by Constitutional protection of private property, the Supreme Court has also defined a role for government input into some land-use decisions.48 Thus on the one hand farmers may make private decisions to plant different crops in response to changing growing conditions and/or market prices. On the other hand, homeowners may be compelled to respond to policies, zoning, or regulations (at national, state, county, or municipal levels) by elevating their houses to reduce flood impacts associated with more intense rainfall events and/or increased impervious surfaces. Land-use and land-cover changes are thus rarely the product of a single factor. Land-use decision processes are influenced not only by the biophysical environment, but also by markets, laws, technology, politics, perceptions, and culture. Yet there is evidence that climate adaptation considerations are playing an increasingly large role in land decisions, even in the absence of a formal federal climate policy. Motivations typically include avoiding or reducing negative impacts from extreme weather events (such as storms or heat waves) or from slow-onset hazards (such as sea level rise) (see Ch. 12: Indigenous Peoples). For example, New Orleans has, through a collection of private and public initiatives, rebuilt some of the neighborhoods damaged by Hurricane Katrina with housing elevated six feet or even higher above the ground and with roofs specially designed to facilitate evacuation.45 San Francisco has produced a land-use plan to reduce impacts from a rising San Francisco Bay.46 A similar concern has prompted collective action in four Miami-area counties and an array of San Diego jurisdictions, to name just two locales, to shape future land uses to comply with regulations linked to sea level rise projections.45,47 Chicago has produced a plan for limiting the number of casualties, especially among the elderly and homeless, during heat waves (Ch. 9: Human Health).45 Deeper discussion of the factors commonly influencing adaptation decisions at household, municipal, state, and federal levels is provided in Chapter 28 (Ch. 28: Adaptation) of this report; Chapters 26 (Ch. 26: Decision Support) and 27 (Ch. 27: Mitigation) treat the related topics of Decision Support and Mitigation, respectively. Choices about land use and land management may provide a means of reducing atmospheric greenhouse gas levels. A major study by the U.S. Geological Survey is estimating carbon stocks in vegetation and soils of the U.S., and this inventory will clarify the potential for capturing greenhouse gasses by land-use change (an early result is reported in Sohl et al. 201215). There is little uncertainty behind the premise that specific land uses affect the carbon cycle. There are, however, scientific uncertainties regarding the magnitudes of effects resulting from specific actions designed to leverage this linkage for mitigation. For example, uncertainties are introduced regarding the permanence of specific land-based stores of carbon, the incremental value of specific management or policy decisions to increase terrestrial carbon stocks beyond changes that would have occurred in the absence of management, and the possibility for decreases in carbon storage in another location that offset increases resulting from specific actions at a given location. Also, we do not yet know how natural processes might alter the amount of carbon storage expected to occur with management actions. There are further uncertainties regarding the political feasibilities and economic efficacy of policy options to use land-based activities to reduce the concentration of greenhouse gases in the atmosphere. Given the evidence base and uncertainties, there ismedium confidence that land use and land management choices can reduce the amount of greenhouse gases in the atmosphere. Choices about land use and land management affect the amount of greenhouse gases entering and leaving the atmosphere and, therefore, provide opportunities to reduce climate change (Ch. 15: Biogeochemical Cycles; Ch. 27: Mitigation).54 Such choices can affect the balance of these gases directly, through decisions to preserve or restore carbon in standing vegetation (like forests) and soils, and indirectly, in the form of land-use policies that affect fossil fuel emissions by influencing energy consumption for transportation and in buildings. Additionally, as crops are increasingly used to make fuel, the potential for reducing net carbon emissions through replacement of fossil fuels represents a possible land-based carbon emissions reduction strategy, albeit one that is complicated by many natural and economic interactions that will determine the ultimate effect of these strategies on emissions (Ch. 7: Forests; Ch. 6: Agriculture). Land-use decisions in urban areas also present carbon reduction options. Carbon storage in urban areas can reach densities as high as those found in tropical forests, with most of that carbon found in soils, but also in vegetation, landfills, and the structures and contents of buildings.59 Urban and suburban areas tend to be net sources of carbon to the atmosphere, whereas exurban and rural areas tend to be net sinks.60 Effects of urban development patterns on carbon storage and emissions due to land and fossil fuel use are topics of current research and can be affected by land-use planning choices. Many cities have adopted land-use plans with explicit carbon goals, typically targeted at reducing carbon emissions from the often intertwined activities of transportation and energy use. This trend, which includes major cities such as Los Angeles,61 Chicago,62 and New York City63 as well as small towns, such as Homer, Alaska,64 has occurred even in the absence of a formal federal climate policy.